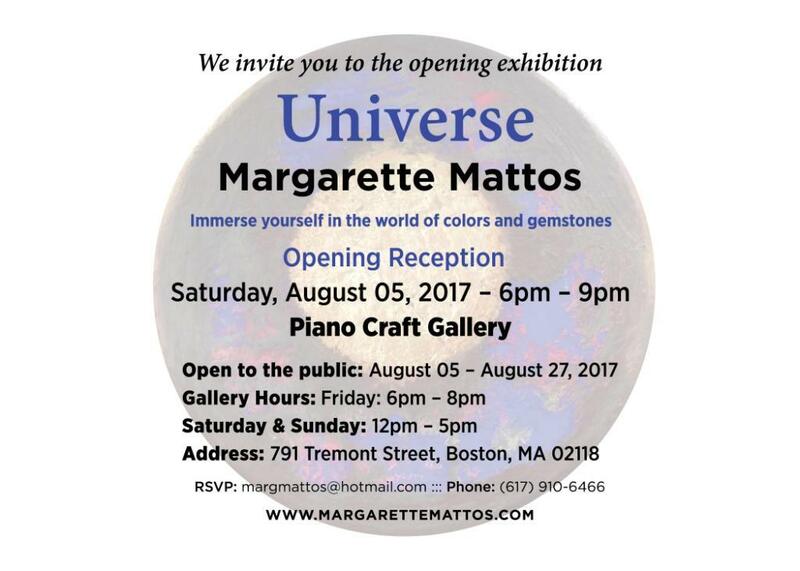 The Piano Craft Gallery is pleased to announce that Universe, by Margarette Mattos, will be closing with a reception on Saturday evening, August 26, 2017, from 6:00-9:00 p.m. Please join us! Margarette Mattos is a Brazilian abstract painter who currently resides in Cambridge, Massachusetts. Her contemporary pieces reflect her innovative technique of mixing iron ore fines with acrylic paint. 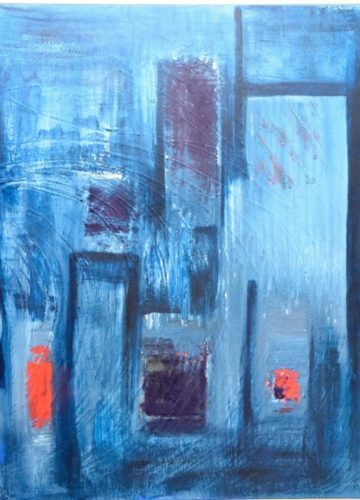 Her paintings are characterized by bold colors and texture contrasts incorporated into geometric and abstract shapes that often resembles windows. Mattos is from Vitória, a city in southeast Brazil. Her career started in the early 1990’s when she was invited to participate in an art project sponsored by the Federal University of Espiríto Santo. The purpose of the exhibit, entitled Visões de Vitória, was to highlight the city’s architecture. While doing research in conjunction with this show, Mattos had her first exposure to the possibility of using iron ore to express herself as an artist. 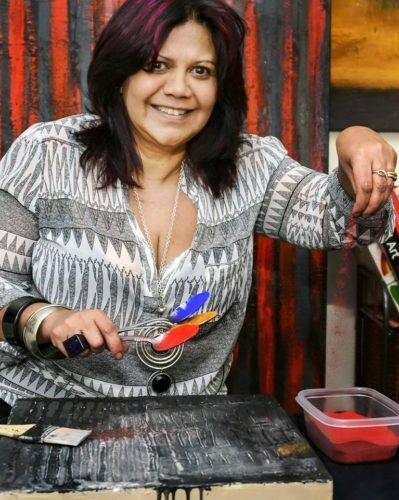 She spent many years experimenting before she found the proper way to effectively incorporate iron ore into her work without losing its luster, texture and distinctive color. In addition to iron ore she uses iron oxide, gold, copper, resins, varnishes and waxes to produce the unique textures, brightness and opacity reflected in her works. 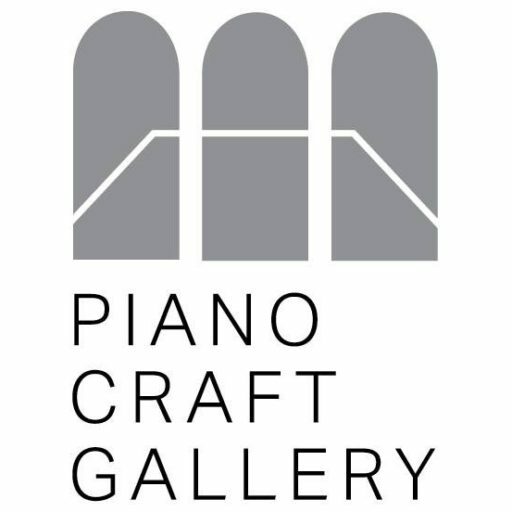 The artist’s paintings have been exhibited in several Brazilian galleries including that of the prestigious Jo Slaviero and Guedes in São Paulo. Recently, Mattos was one of the finalists in the 2014 Brazilian International Press Awards competition in the category of Visual Arts. In the First Exhibition at Brazilian Artists of New England, she received first place. Additionally, the Cambridge Art Association of which she is a member awarded her first place in the category of Small Works. A fascination with the colors and textures of raw iron ore extracted from the Itabira and Serra dos Carajás areas of Brazil is the inspiration for my work. By combining the ore with acrylic paint I produce abstract images on canvas. I started using iron ore in a casual way. Many years ago while I was doing architectural research about my hometown in Brazil, I become curious about ore. I learned that it has a variety of shapes, colors, textures and sparkles. I knew that color and texture are all an artist needs to create, so I decided to incorporate the use of ore in my work. It took two decades of research to discover and perfect the best way in which to incorporate ore particles in my work without losing the unique luster, texture, and color of the raw mineral. 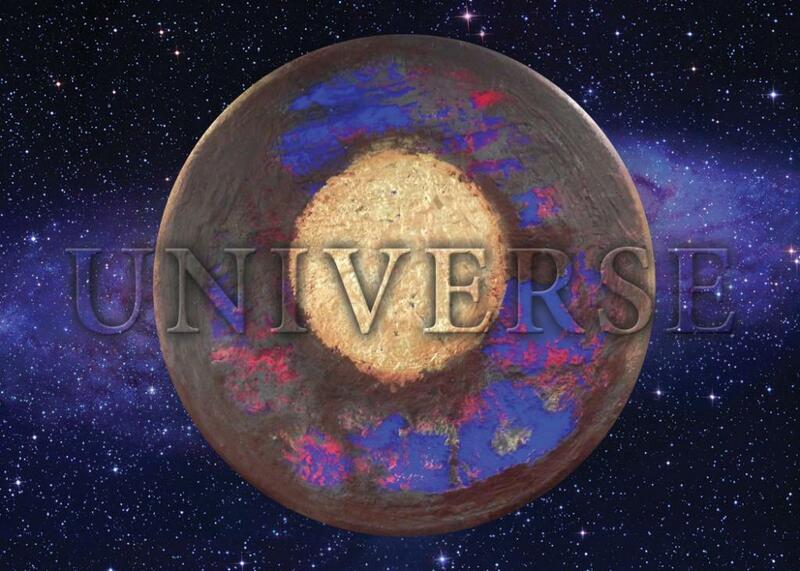 In my paintings I utilize steel oxide pigments in combination with varnishes, waxes, acrylic, and vinylic resins. The over-layering of these materials on canvas creates textures and bright hues which highlight the opacity and velvety of both abstract shapes and basic forms such as circles and rectangles. Please visit www.margarettemattos.com for more information about her work. This exhibition runs from August 4-27, 2017, with an opening reception on Saturday, August 5, from 6:00-9:00 p.m.